Above: My parents, Panagiotis and Metaxia and Panagiotis. Above Right: Fare-welling someone who is migrating abroad. I am the fourth girl from the left (in the background). The accordion player is Dimitris Ganosis and the violin player is Pandelis. Above: At Neohori with friends. 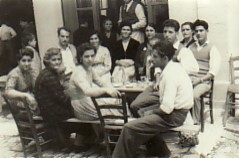 In the back row are: Grigoris Koutlis, Eleni and Persa Katsarou, unknown, unknown, Efthimia and unknown. In the front row are: myself, Irini Mavragani (my aunt), Evangelia and unknown. Above Right: With my fiance at the time, Emmanouil Achilaras. Above: With my husband, Emmanouil, and our children, Panagiotis, Irini and Nikos. Above Right: With my daughter, Irini, my husband, Emmanouil, my brother, Vasilios and my mother, Metaxia.